Shipping cargo by containers from China is a economical method for exporting heavy goods. With years of experience in the International logistics industry, we are a reliable freight forwarder. Types of cargo can be general cargo, household items, personal effects, vehicles, machinery and many other kinds of goods. We provide various kinds of container sizes to meet your needs of international shipment. We transport to many overseas destinations in all the continents. No matter you need shipping containers with enough space to transport a vehicle, or extra space to transport general goods, we offer all kinds of container shipping services to handle your cargo and suit your budget. Hesitate what kind of container you need? It is easy for you to fill in our online freight estimate page, and you will get a detailed quote based on your cargo. Feel free to email us right now at info@prochinafreight.com to get more details about our selection of cargo container sizes. 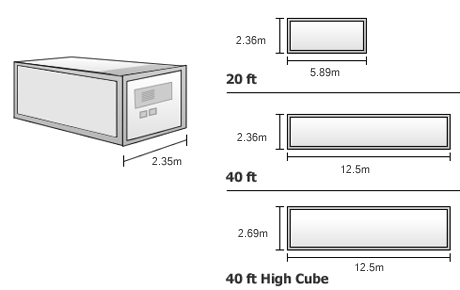 Look at the following diagrams for the specification about cargo container sizes. Because of producers and inner structure of container, Dimensions and maximum payloads can vary slightly from these figures listed above.